First getting on the approaching storm roughly 3 miles southeast of El Reno, directly east-northeast of the already large tornado. Tornado tough to pick out at the time due to what looked like a large hail/rain core underneath. On the north side of the storm, well defined feeder inflow bands sucking in the rich low level moisture. Even mid-level moisture bands can be seen spiraling into the intense supercell. Tornado on the left underneath the storm updraft. Can clearly pick out the wedge tornado underneath the impressive structured supercell at this time. Taken over my right shoulder as we were bailing south to get out of the way. Stopped only for a brief moment to look back and snap the photo as this was the closest we came to the monster tornado. Tornado begins to get even larger and take a hard left turn towards I-40 as we watched from SW 15th St and Evans St.
Another shot looking north-northwest as the tornado was starting to move by us and go over I-40, becoming even larger and picking up speed in the process. Had to crank up the contrast here, but I believe this is close to when the tornado was at its largest. Reported as large as 2.6 miles wide! Notice the entire mesocyclone now on the ground. 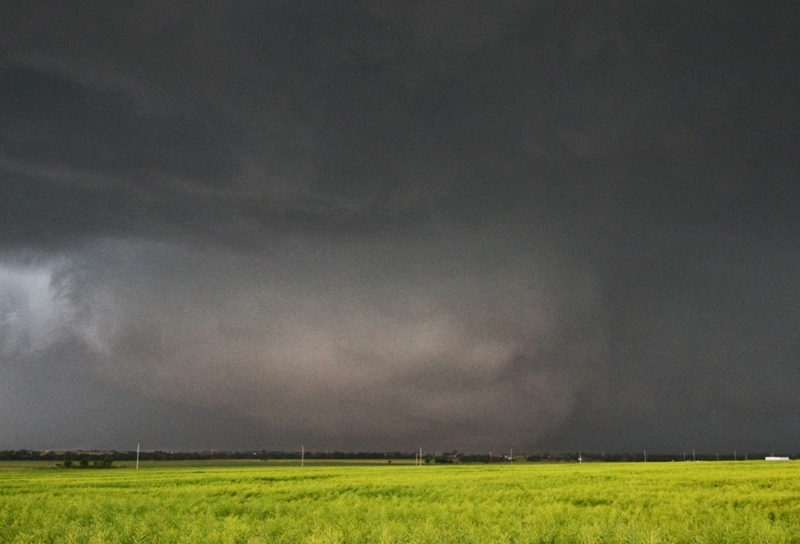 Another shot of the incredibly massive tornado in the distance as it was moving away and wrapping into the supercell. Incredible phased array radar imagery of the tornadic supercell that spawned the powerful, massive tornado. RAXPOL radar imagery. Notice in the DBZ and VEL imagery how clearly you can see the main tornado and the satellite tornado. ZDR clearly shows large debris ball with foreign objects to the radar indicated in green and blue. Rest in Peace and God Bless Tim and Paul Samaras, Carl Young, and others who lost their lives to this tornado. The El Reno Tornado will go down as one of the most remembered tornadoes in history and the largest tornado ever recorded to date. This tornado was originally classified as an EF-5 with winds of 296 mph based on mobile radar, but has since been corrected down to an EF3 based on damage assessments. It was also a record 2.6 miles wide at its largest point. It grew from 1 mile wide to 2.6 miles wide in 30 seconds! What a monster. 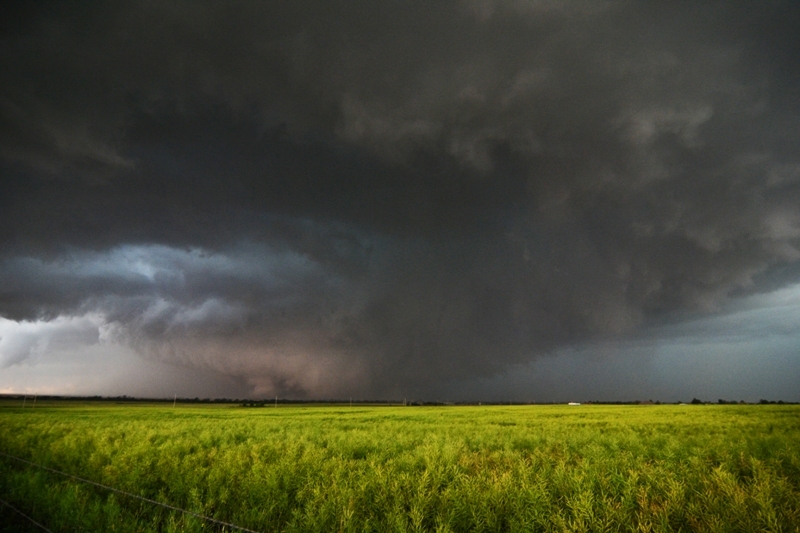 May 30th was my last day of chasing as a tour guide for Silver Lining Tours, but thinking Friday was going to be a big day near Oklahoma City, I decided to stick around and chase with some friends. I met up with Peggy Willenberg, Melanie Metz, Kevin Van Leer, and Kate Demchack in El Reno, OK as the first cumulus towers began to develop on the intersection of a stalled front and dryline. The environment was extremely unstable with 4,000+ J/KG of MLCAPE, temperatures in the upper 80s, and dewpoints in the middle 70s. 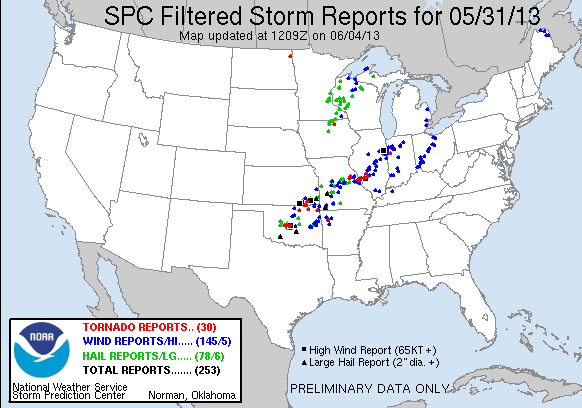 In addition to very steep lapse rates supporting large hail, surface winds were backed out of the south-southeast with 50 kts of effective shear and decent mid and upper level wind speeds, supporting a substantial tornado threat with any supercells that developed within this environment. As a result, the Storm Prediction Center issued a Particularly Dangerous Situation (PDS) Tornado Watch at 3:30 PM CDT. Initially, there were 3 intense storms that developed on this boundary intersection but these congealed somewhat, which made me think that maybe this day was not going to turn out to be a big tornado day after all, especially since the few days before did not work out as planned. We first went west on I-40, then north on Hwy 270 towards the northern storm with 60k foot echo tops. At this point to the north of Calumet, we could see all 3 storm bases as the storms were intensifying and starting to produce a few lowerings. When the storms started to congeal, we decided to head east on 248th St NW towards Okarche, and then get ahead of all of the storms on the northwest to southeast angled road of Hwy 3 towards Yukon. I did contemplate turning around and heading back south on Hwy 81 to intercept the tail end storm, which was starting to look the best, but this decision not to do this turned out to be a very good one. We went south on Hwy 4 in Yukon and then Hwy 92 south of I-40 as the southern storm became tornado warned. Already traffic was starting to get bad as we were caught in some rush hour congestion and we slowed to a crawl as we attempted get south. I noticed an option to head west, directly at the developing hook echo, on some gravel roads so I took it. This ended up working out perfectly as there was little to no traffic and open roads for us to work with as we approached the storm. We ended up stopping near the intersection near Reuter Rd and Evans Rd, roughly 3 miles from the approaching tornado that we could see was rain-wrapped but visible, along with a satellite tornado that you can see in the video to the right side of the main tornado. I had enough time to take some photos and video, but clearly this was not a storm to mess with as it was getting larger by the minute and moving right towards us. I decided to bail south on S Evans Rd and east on SW 15th St to watch the ever growing and intense wedge tornado pass by. This is when the tornado unexpectedly quickly grew and made a sharp shift to the north towards I-40 and unfortunately injured and killed several chasers in the process. As I recorded the tornado on my camera, I walked away for 30 seconds, came back and the whole tornado to my amazement had exceeded the viewing pane. It was incredible to see a tornado grow that large in that short of time. It was hard to get real excited about this strong and massive tornado, knowing there were probably people and homes in its path, especially since it was approaching Yukon. After leaving this tornado, we paralleled the storm to the east on SW 15th St into the south part of Yukon, seeing power flashes occur to my northeast along the way. This is when the traffic started to really become a problem. I attempted to bail south and get out of the way of the second and third couplets that were on storms approaching from the west and taking a dive to the southeast. I became stuck in bumper to bumper traffic trying to get across one of the few routes across the Canadian River (S Mustang RD to Hwy 4) in Southwest Oklahoma City. This is when a couplet on radar passed just behind me and my car was slammed by roughly 50 mph RFD winds and people really started freaking out. It was mass chaos as people started abandoning their cars and running for any shelter that they could. There were vehicles slamming into other vehicles, people getting rear-ended, and a total loss of laws and rules that you would see more in a movie rather than playing out in front of you in real life. I witnessed several accidents and people just kept driving, leaving others stranded with disabled vehicles. After that debacle, they police started opening up all lanes across the river and south and not allowing traffic to go back north so we got out of there and over to Tuttle on Hwy 37 and then south on Hwy 93 before the next and stronger couplet on the third storm reached the area. I can honestly say that this is the first time that I thought about leaving my vehicle to find shelter from a tornado as we were not sure if we could beat the third couplet due to the horrendous traffic and almost tried getting into a church. It was the first time that I thought I was trapped in a bad situation with a tornado and no place to go…definitely a scary ordeal. We made it around the storms to the west and then back north on Hwy 81 where we drove through a lot of flash flooding and a large damage path between Union City and El Reno. Here is where there were overturned cars, some thrown well into fields away from any roads, and police and ambulance lights as far as you could see to the east. It was a very eery scene to a scary and deadly day.